Best time to GO: Big Sur is a great place to visit anytime. From April to October the weather is consistently beautiful. Peak Season is July and August, but keep in mind some businesses may be closed in the off-season. We chose to go in May, hoping to beat the summer crowds. 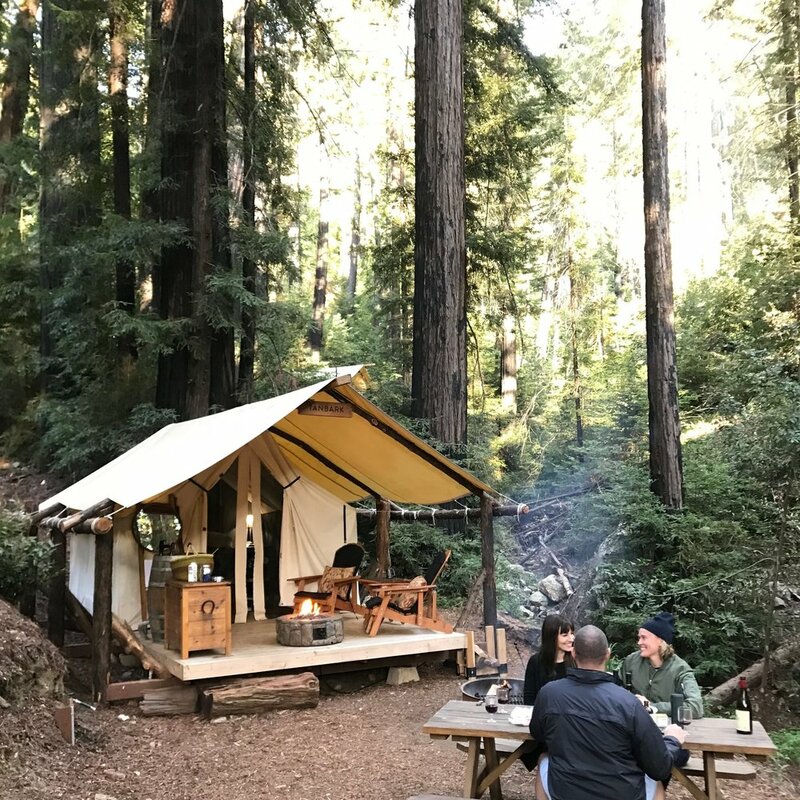 Glamping in Big Sur has been on my bucket list for many years, so when we had the opportunity to travel here with friends we quickly agreed. We took a non-stop flight from Minneapolis to San Jose (SJC), picked up a rental car from the airport and made the easy 75 mile drive to Carmel. We stayed and explored Carmel for a few days before our much anticipated road trip South on Highway One to Big Sur, where Pacific Ocean views, a rocky coastline and a vast wilderness awaited us. Big Sur refers to the 90-mile coastline between Carmel and San Simeon, accessed primarily by Highway One, which winds cliff-side along the Pacific Ocean. In 2017, two weather related events shut off access to Big Sur. From the North, the Pfeiffer Canyon Bridge was closed from winter storm damage and from the South a landslide at Mud Creek buried Highway One. It took 8 months before the Pfeiffer Canyon Bridge reopened allowing drivers from the North to access the area, but travelers from the South still faced extensive detours. Over a year later and $50 million in road repairs, travelers from the South can now drive the entire stretch of misty coastline. Located near the center of Carmel by the Sea, this charming boutique hotel has spacious cottage-style rooms with gas fireplaces, comfy bedding and Nespresso coffee makers (this made my friend Ann very happy). We enjoyed a continental breakfast in the morning and complimentary Northern California wines in the lobby at sunset. The atmosphere was relaxed and chatty but quieted down by 10 pm. Make sure to visit their adorable on-site pub and mingle with the locals over lunch. RTip: is to grab a drink from Brophy's Tavern and end your evening in the cozy courtyard by the firepit and hot tub. Originally a mansion built in 1905 this hotel is a bit pricier then Hotel Carmel, but that's because it offers dramatic ocean views, insanely beautiful gardens, an outdoor swimming pool and is only a short walk to Carmel Beach. While you can also walk into town, they do provide a shuttle service for convenience. RTip: if you're traveling with 4-legged friends, the locals recommended the quirky Cypress Inn, where pets of all shapes, sizes, and breeds are welcome to join the family vacation. The lux Ventana Big Sur Resort is quite well known, but would be considered pricey by my standards. So as soon as they introduced the more accessible glamping sites, I moved this experience up on my list. They have two Glampsites available, Redwood and Canyon. We chose the Canyon sites, which are easy to access but feel like a world away. Although the Canyon sites are a bit more secluded, both are only a short walk from your car. No hiking or backpacking required. With so many amenities you feel like you are at home, tucked away in your cozy safari-style tent. Comfortable heated beds, luxury linens, decks equipped with a gas fireplace, a sink with hot water for tea, and an ice box for beverages... the list goes on. You only have to leave to use the bathroom, and even that's not far! Reality is your bathroom is a fabulous smelling portable camper. When it's time to get cleaned-up you can visit the nearby luxury spa bathrooms with teak showers, fluffy towels and complimentary shampoo and conditioner. For an extra $100pp you can take advantage of the main resort's social house and pool. As if you need another reason to book a stay, Ventana recently introduced the ‘SurStream’ a mini Airstream bar under the canopy of the California redwoods. This portable camper offers offer a full bar, snacks and a pop-up summertime bbq on the weekends. Rtip: If you prefer traditional tent camping, try the Ventana Campground. The sites are located just before the glamping area in the same beautiful canyon. These cute little cabins nestled in the woods came highly recommended by a contributor. Various accommodations are available here, all offering a secluded, quiet escape. The Big Sur Cabin has an incredible outdoor area with a fire pit and side by side soaking tubs to relax and recharge under the stars. Even if you aren't staying on property, consider a stop at their restaurant, The Roadhouse for Mid-century vibes and really good food. RTip: Another fun way to explore California's central coast is in the back of a vintage VW camper. We have contributors who have experienced this first hand, through VW Surfari ,and would highly recommend the trek north from the beaches of Santa Barbara into Big Sur on Hwy. 1. A visually stunning stretch of roadway that hugs the pacific coastline from Pacific Grove to Pebble Beach. From Carmel, you can enter through a gate on North San Antonio Ave and 2nd Street where you will pay 10.25 (cash only) per car to take the route through this exclusive neighborhood. The guard at the gate will give you a brochure with points of interest to stop at along the way. Be sure to seek out the iconic Lone Cypress which is considered to be one of the most photographed trees in North America. Rtip: If you are a golf enthusiast, or are traveling with someone who is, head to Spanish Bay to watch the Scottish Bagpiper signal the course closing, a daily tradition (rain or shine). If you have the time, consider reserving a fire pit at Sticks restaurant where you can relax and enjoy the sights and sounds of the course. Carmel Beach and the Carmel River State Beach (Monastery Beach) are both worth a visit. Carmel Beach is the busier, more traditional, beach near town. It is great for walks, sandcastles, playing in the waves, surfing and even a bonfire at night. The State Beach is located south of town on your way to Big Sur. This is a more robust, expansive beach where you can put your feet in the sand and watch the waves crash. Keep in mind that the surf can be unpredictable and you'll need to be careful. I found this out after getting unexpectedly drenched. Heading South on Highway One you feel like you want to stop everywhere and take it all in. One place I highly recommend exploring is Point Lobos Park Reserve, where you can enjoy breathtaking views of the coastline while getting some exercise. We visited during the week so the hiking trails were relatively quiet. There is parking on the highway but we opted to enter the park, pay the $10 fee and grab a map. We followed the Cypress Grove Trail, where if you are lucky, you can see the seal pups below in the cove. To me, they sounded a bit like zombies but maybe that means I've been watching too much Walking Dead. If you have time, check out the Whaler’s Cabin, which is a 160 year old fishing shack that overlooks Whalers Cove and Carmel Bay. Rtip: Limekiln State Park is a favorite with the locals and a little quieter experience. From here you can hike to see the waterfalls, discover limekilns (Don’t worry I had to look it up too) in the forest or walk along the beach. There are a multitude of state parks in this region and this one is both beautiful and convenient. This is where the Santa Lucia Mountains and the Pacific ocean meet. Go for a hike and experience the breathtaking coastline and redwood lined canyons. If you choose the Buzzard's Roost trail, like we did, be prepared to climb uphill and wonder "when it will end?" However, when you reach the top-the view will be worth it. You might find a few of the trails closed for safety due to erosion so make sure to check the website or inquire at the ranger center when you enter the park. Currently, McWay Falls Overlook trail is only partially open, but don’t worry, the iconic Mcway Falls can still be seen from the section of trail that remains open. RTip: Ask the park rangers how to get to the Big Sur Taphouse and they will give you a slip of paper with directions so you can find the Bypass Trail and hike there for some great local craft beer. This hidden beach is a bit difficult to get to, but worth every effort. Many people miss this experience because it is a bit out of the way. Go early to avoid traffic and prepare yourself for a drive down a narrow winding road. The parking fee is $10. If you do not want to make the drive yourself, I am told you can take a $5 bus ride from Big Sur Park. Take a walk along the purple sand beach, see the iconic and beautiful rock formations, explore, climb and soak in views. It can be uncomfortably windy and chilly, so dress appropriately. If you decide to visit this shop, you must go hungry. With over 300 different varieties to choose from, this place is cheese heaven. The gracious and knowledgeable staff will encourage you to taste samples from all over the world. We tasted cheese from villages near Quebec to the Burgundy Region of France. You can prepare for a picnic lunch or bring some back to your hotel for a snack before bed. We made sure to load up on cheese, crackers, and spreads for our glamping trip to Big Sur. 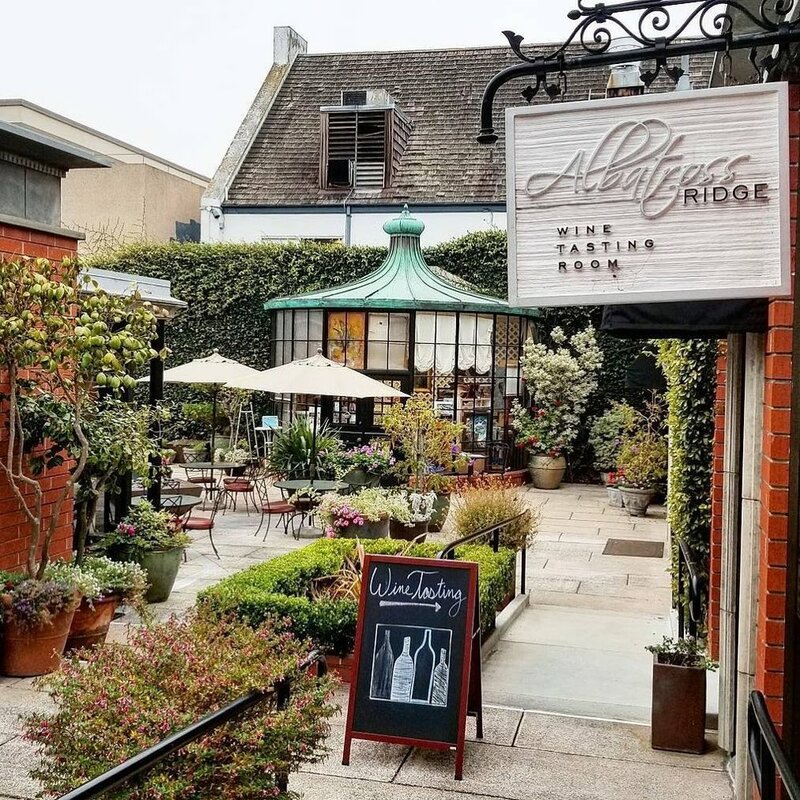 Rtip: if you do decide to go on the wine walk, you'll find this cheese shop right across the courtyard from the Blair Tasting Room. It's a wonderful little way to enjoy a small bite before your tastings. A beautiful boutique located on the corner of Mission and 7th in Carmel, this shop has a great selection of women’s brands like Rails, Mother, Rebecca Taylor and more. There is no information on-line, so it feels like a bit of a treasure. Find them on instagram or pop in and check them out. Many items are splurges, but certainly worth a peek. There was plenty of food that we didn't have time to try on our weekend getaway. It was hard to leave our cozy campsite and the wine & cheese we brought with us. Here is a sampling of the culinary experiences we did enjoy. Tucked away in corner of a strip mall, this unassuming bakery has some seriously delicious pastries, quiche, baguettes and desserts. They also have a super cute outdoor patio but I suggest bringing a sweater as it can get a bit chilly. Stop here for breakfast before your road trip to Big Sur, or grab sandwiches to-go on a picnic at Carmel Beach. This cute pub was recommended to us by friends so we stopped for a late lunch during the wine walk. The oysters, calamari and shrimp tacos offered the perfect mid-day sustenance. We filled our bellies and were back on our way. We were craving something sweet but torn between having dessert at La Bicyclette or having churros at Cultura, both highly recommended. 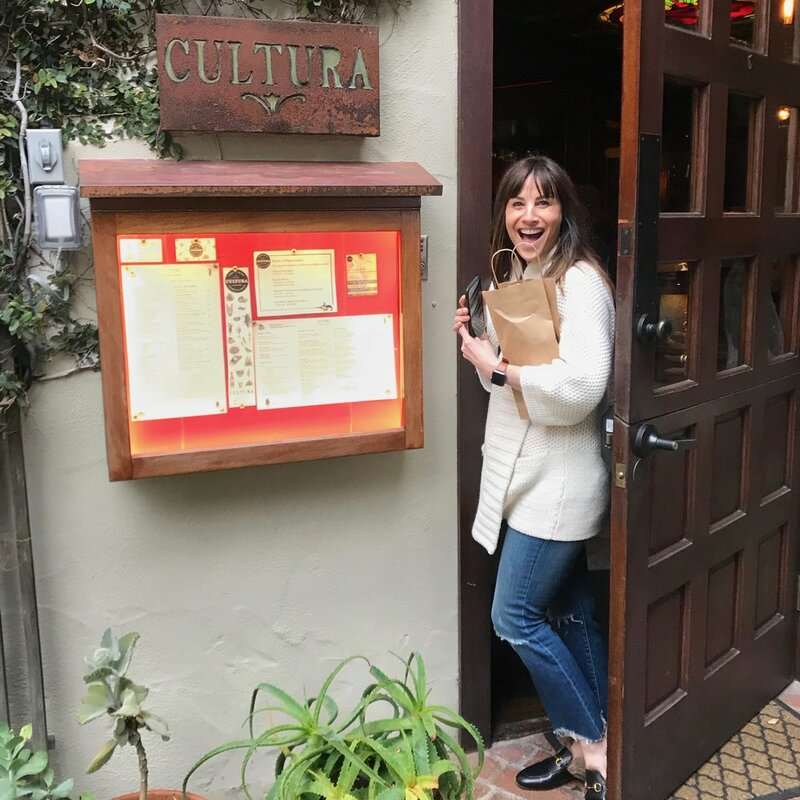 It ended up, Cultura was the perfect warm and cozy end to our evening. If only we left room to try their street tacos. Lobster Benedict anyone? We are literally still dreaming of the breakfast we had at Katy’s Place. You can see a full write up on this cute cafe here. Without coffee readily available at your glamping site, you're going to want to know where the Big Sur Bakery is located. Ideally we would have loved to have pizza delivered to the glampsite as well, so while they don't deliver, we hear the best pizza is here. The view at Nepenthe, coupled with the shrimp BLT, really made my day. Keep in mind, this place gets very crowded, and you will wait. There is a viewing area where you can enjoy a beverage and pass the time. If you're okay skipping the view during your meal, you are welcome to grab a spot at the bar. Whatever the case, be sure to ask the bartender the history of the restaurant, it is a great story firsthand, and much more detailed then the website describes. Half of our group choose to go downstairs on a lower deck to Cafe Kevah. It was less crowded, offered even more sweeping views, and served breakfast until 3:00. Wow-another view to remember. If you are staying at Ventana, this is a beautiful place to have dinner one night. You can also order "take away" from the bar to enjoy at your glamping site. Be warned though, as with most things in Big Sur, it's expensive! 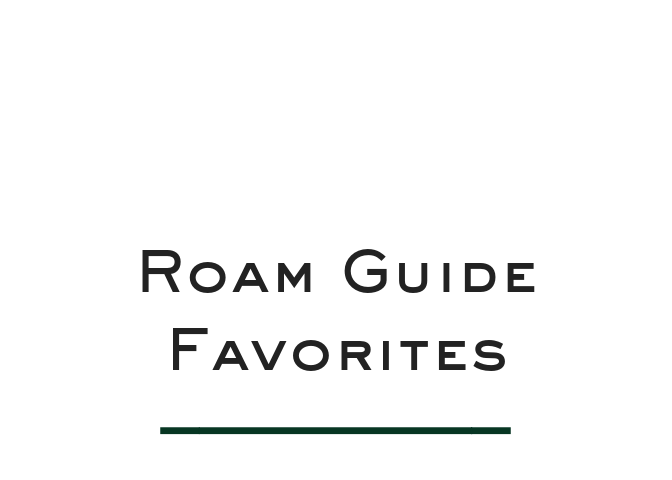 Rtip: If you're on the hunt for incredible views, we had a local couple from Carmel encourage us to stop The Post Ranch Inn for what we they consider the best view around. Trouble is, if you are not a guest, you need a reservation and there are no walk-ins allowed at the bar. Layers, it gets chilly especially under the canopy of the Redwoods. I wore my Madewell Surplus jacket over everything. Cozy slippers for the campsite (trust me, you need these), a hat and a good book, this one by Ruth Ware is the perfect thriller for a weekend in the woods. I like to keep a separate dopp kit filled with all my favorite beauty essentials, all bottled up and ready to go, perfect to carrying to the bathroom on your glamping site. It's also a good idea to bring a Jet Bag in case you have a bottle of wine to bring home (we did). Did you know it will soak up the entire contents of one bottle of wine if it breaks in your bag? So much to see, a long weekend was not enough. Two 'must sees' on my list for next time are; The Hearst Castle, I am a sucker for a mansion tour, and the Esalan Institute for public night bathing (oh my!) in the hot springs. Click below to see a detailed map our trip from Carmel to Big Sur. Another great map of the area can be downloaded here, courtesy of the Big Sur Chamber of Commerce.